There are some Italian varieties of rice that thanks to anthocyanins (pigments with antioxidant and anti-cancer properties) take on a particular color, such as Venere rice, commonly called black rice and Ermes rice, called red rice. It is also possible to color the rice with vegetables. 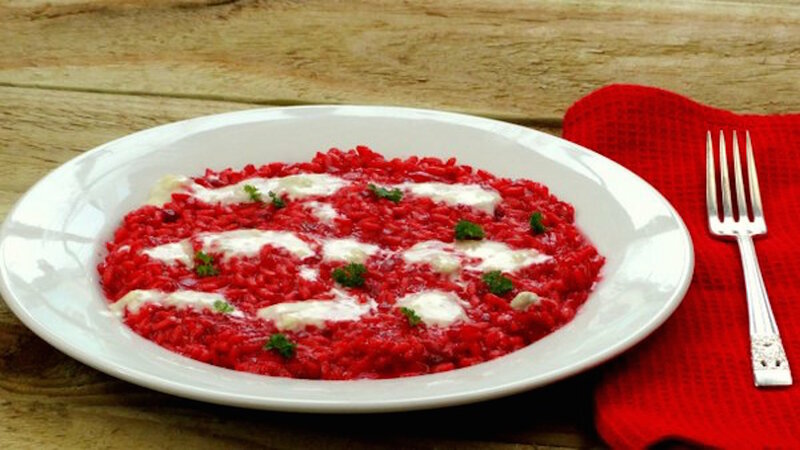 For example, if you use beetroots, risotto will be colored red. Don't you also want to taste it? Prepare the soffritto by chopping finely the onion, the carrot and the celery stick. Using two tbsp of olive oil, stir fry your soffritto until translucent in a saucepan. Bring one liter of water (35 fl oz) to the boil, then dissolve the stock cube in it. Mash the beetroot with a processor. Add the rice to the pan stirring all the time over medium heat for about 2 minutes. Add the wine and stir one minute more, until it evaporates. Add the cooked beetroot, salt, pepper and 1 tbsp of chopped parsley, then slowly add the broth. Cook the rice keep stirring all the time and topping up with the broth as it dries out. Normally rice for risotto cooks in 18 minutes but it is better to follow your packet instructions. In a saucepan, melt the Gorgonzola with the milk over low heat. Leave a knob of cheese out. When the rice is cooked, switch the heat off, then add the knob of Gorgonzola and 2 tbsp of Parmigiano Reggiano and mix well. Serve with the melted Gorgonzola on top and a few parsley leaves. The soffritto is one of the bases in Italian cuisine. It makes the base by adding flavour to soups, risottos, pasta dishes, fish and meat.